In order to meet the individual requirements of the clients, we offer a wide array of Forging Furnace that is valued for durable performance and smooth finishing standards. They are precise in designs and are fabricated as per the individual requirements of our clients. 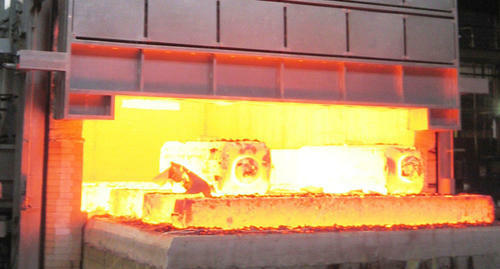 Forging Furnace is offered with varied technical capacities and is delivered in well-defined time. Established in the year 2011, we, Therm-process Engineering Private Limited, are among the prominent manufacturers, suppliers, and exporters a wide range of the optimum quality of Burner & Furnace Accessories. The product range offered by us is inclusive of Automatic Burner, Reheating Furnace and Forging Furnace. Their sturdy construction, high performance, thermal stability, minimum maintenance & working cost, less energy consumption, and durable construction, make these furnaces and burners highly demanded. In addition to this, we are one of the leading service providers of Furnace Repair Services. With the aid of our experienced technicians and other supporting staff, we have been able to systematically execute the offered services within the assured time frame. Our product range is highly demanded in steel plants, rolling mills, and automobile & aluminum manufacturing industries. We have been able to cater to a huge clientele across the globe such as Sharq Sohar Steel Rolling Mills from Oman. Mahindra Ugine Steel Co. Limited and Shri Bajrang Metallics Pvt. Ltd. are some of the valuable national customers that are associated with us over a long period of time.